Painting with Light | Andy Spessard Photography. Architectural and Commercial Photography. Columbus, Cleveland, Cincinnati Ohio. Exploration of light, time, color temperature and space…Painting with light. This entry was posted in Architectural Photography and tagged Andy Spessard, Andy Spessard Photography, Architectural photography, Architectural photography Columbus Ohio, Columbus Ohio, Commercial photography Columbus Ohio, Fine Art photography Columbus Ohio, Interior Design Photography Columbus Ohio, Landscape, Landscape photography, Landscape Photography Columbus Ohio, Travel, Urban exploration by andyspessard. Bookmark the permalink. Hello,This is really nice post. You sharing post related to painting with light. I love this post. Thank you so much. I am glad you enjoy my work. 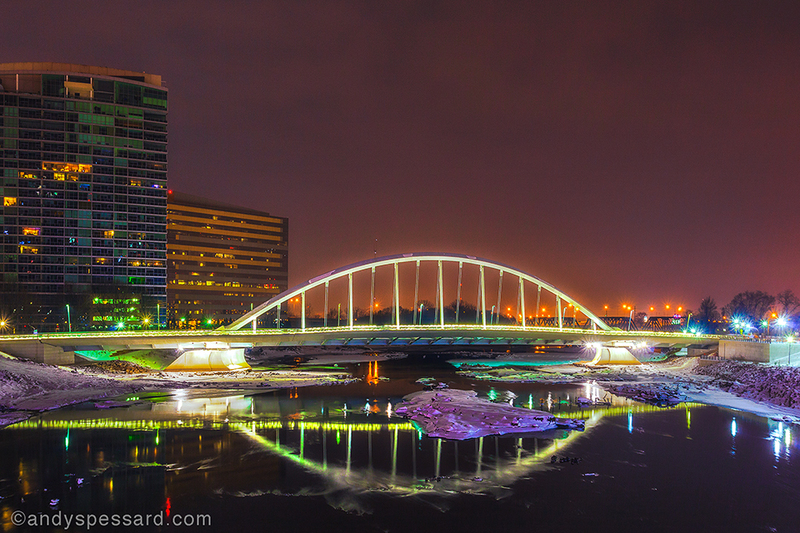 I photographed this image on the Town Street Bridge, Columbus, Ohio, on one of those cold wintry nights we’ve had this past year. I balanced my camera on the ledge of the bridge and was able to create a long exposure to capture the shadowy and color details. Thanks again for sharing your comments. Stop by and visit anytime.